Gut health has many implications on overall well-being of all livestock species. The most notable effect obviously being the digestion and absorption of feeds. Proper digestive health is important in livestock for many reasons. But first and foremost, digestion and absorption of nutrients is the foundation to fuel physiological processes and allows your animals to achieve maximum genetic potential. Not to mention, proper digestive function will lead to lower incidences of digestive upsets that can lower performance and productivity. But what exactly is gut health and how exactly does it impact digestion and absorption? Regardless the physiological make up of an animal’s digestive system, good gut health is the cornerstone to ensuring an efficient digestive process. In the rumen, good gut health means maintaining a stable and correct population of microbes to mitigate digestion. These microbes not only help digest feedstuffs more efficiently, but also helps insure a balanced pH to prevent digestive upsets. This same concept also applies to the hindgut in some monogastrics like horses and rabbits. Maintaining a proper balance in microbial populations will allow for more thorough digestion of feedstuffs and more efficient absorption of available nutrients. Alternatively, good gut health in monogastrics focuses primarily on maintaining a correct and steady pH. Proper pH activates digestive juice and enzymes necessary to help break down feed. This in turn is vital in maintaining the integrity of the stomach lining, as too acidic of a pH can lead to ulcers. Maintaining the integrity of the gut lining and the cells that reside there is also very important to facilitate absorption of digested feedstuff. Let’s face it, without adequate absorption, improved digestion is irrelevant. The bottom line is that only when the gut is healthy will execution of digestive processes be most effective and efficient. To support good gut health, there are several important practices to abide by. These simple steps include allowing access to good quality feed and/or forage, being consistent in your feeding protocols, and supplying a prebiotic like Amaferm to ensure a healthy gut. Amaferm is research proven in all species of livestock to improve the digestion and absorption of the many kinds of feedstuffs we have available to us. Amaferm is also available in the entire line of Sure Champ products. 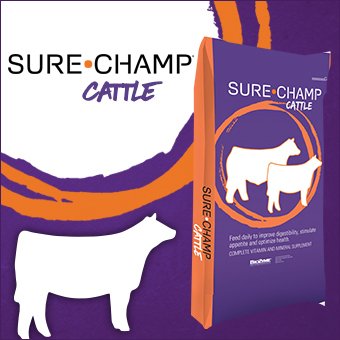 The Sure Champ® brand of products are designed help show animals maintain optimal performance while coping with all the challenges that come with life in the show ring. The first way to maintain proper digestion and absorption is with Sure Champ Cattle. This is a pelleted, daily vitamin and mineral supplement for show cattle that can be top-dressed or mixed in a ration to improve digestive health, stimulate appetite and optimize growth and performance. Results aren’t only seen in the show ring from using Sure Champ. Since the Sure Champ cattle formula is similar to our popular VitaFerm® Concept•Aid® products, and is considered a fully fortified mineral, it can also be integrated into rations for developing bulls and females to achieve reproductive benefits. Digestive health and keeping your replacement bulls and replacements on the right track is equally important. One of the biggest challenges with feeding livestock is keeping them on feed and moving towards a performance goal. This is especially true in small species such as pigs, goats and sheep, where every day on feed matters. If an animal becomes ill or has a setback, time and gain are quickly lost. This negative consequence is multiplied in small species because you are only feeding them for a short amount of time. Sure Champ Spark is the ideal solution to maintain proper digestion and absorptive capabilities of the gut. Spark is a pelleted top-dress that provides a safe, easy way for show livestock to receive the Amaferm® advantage when aggressive appetite is needed. In addition to its convenient low feeding rate, Spark also includes MOS to trap bad bacteria, limiting their ability to do harm to digestive health and intake. By being proactive with your animal’s nutritional program, you can promote consistent feed intake, while also improving performance and preventing other digestive issues from occurring. Bottom line, when animals feel better on the inside they look better on the outside.